20" x 16" x 8.5"
Capacity 15.5" x 11.7" x 2"
The Express Backpack is an incredible value! This style was specifically designed to comfortably carry your computer and give you the extra room that you need for your books and accessories! Designed in four cool color combinations, this style has it all - notebook protection, style, organization and durability! Easy Transport Cool-Mesh ventilated back panel and padded shoulder straps allow convenient and comfortable transport. 15.5" x 11.7" x 2"
Holds laptops up to 16"
Pros: If you are an Information Technology guru who does alot of traveling for business this is the most ideal pack for you. I have tried a number of packs, but with this pack, it was love at first sight. Ordered this pack before traveling on a 3 week detail. It easily holds my Dell XPS 15 laptop, laptop charge chord, Dell Streak 7" tablet, tablet charge chord, Tablet Docking Station, iPhone 4, iPhone charge chord, wireless usb mouse, screen cleaner, travel dossier, sunglasses, pens, pencils, flash light, bottle of water, and still has plenty of pouches for any other odds and ends you want to pack in. The most important thing is that it is all packed in snuggly and well protected. If you have head phones that can control playback of your mobile device then the head phone port is amazing. This bag literally has endless utility. Cons: If you are going to be lugging more than one book around this is not the bag for you. This is more of a "gadget guy" bag. Other Thoughts: I am a big guys. I am 6'5" with broad shoulders. I have a problem with wearing most backpacks. I can slip this one on and off as easy as one of the little guys and it doesnt look like im wearing a tiny cupcake on my back. Pros: Lots of places to put stuff. Comfortable. Holds the laptop secure. Cons: Does not provide a lot of protection for the laptop. You still have to put the backpack down very very gently, and you cannot run with it without risking damage. Of course you CAN run with it and receive no damage to your laptop, but it definitely is not secure enough to keep it from shaking a whole lot. Pros: Great protection for the laptop, comfortable, has a good range of places to store stuff. My personal favorite part about it is how much it opens. It doesnt just open the top it opens almost completley and gives easy access to everything (especialy small stuff you might lose in the bottom when u drop it). Cons: None that I can think of really! Other Thoughts: Buying another one cause I just spilled goo all over it while cleaning up around the house. Totaly my fault, stupid of me to have set it down next to the trash. To note though the laptop protected everything inside it while I franticaly pulled them out. Pros: The backpack is great if your going to lug around a couple textbooks on top of your laptop. I really don't think this would be for the high schooler who has to carry around 3-5 thick text books...if that's what your looking for then go with Swiss...This pack is awesome even when you have the thing full because it keeps its shape and always looks slim. Great compartments and is very oriented towards the tech geek who carries around a few CD's, charger, WD passport. It even has a sweet holder on the shoulder strap for a cellphone or a nano. Balances fairly well (though I have a habit of leaning my backpack against other things anyway), and the construction feels quite solid. Cons: With the textbooks in at the same time as the laptop, the thin profile of the backpack gets sort-of stretched outward, making it less aesthetically pleasing. This is a petty con, so I did not deduct for it. Also, the zippers could be more solid (they are plastic) and the padding for the laptop compartment could be more thorough. Other Thoughts: Great pickup for a college student. The notebook portion of the backpack is bigger than I initially thought - and I was already expecting it to be too large, since I have a 13.3" laptop - so I am going to add extra padding in the places where the backpack's falls short. Overall very pleased with my purchase and would recommend it or the Wenger (SwissGear) Synergy for anyone looking for a quality 15" laptop backpack. The Synergy is obviously better, but you get what you pay for and this is well worth the price. 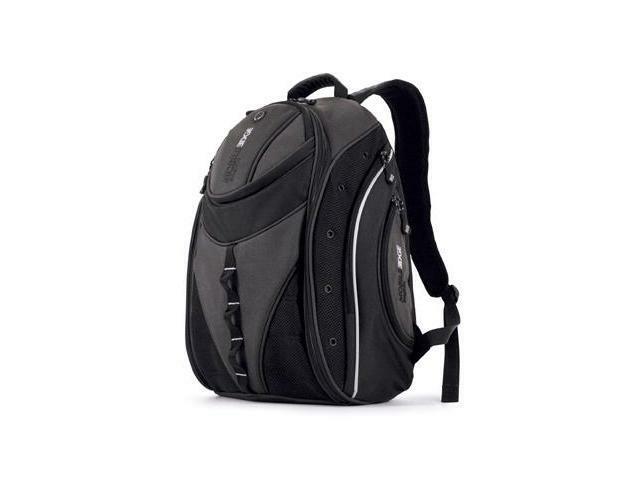 Pros: Good sturdy backpack at a good price with a lifetime warranty. Other Thoughts: Plenty of room for my gear. Got plenty of room for my 13.3" macbook pro and extras such as cables, external 2.5" hard drive, pocket for portable audio player with headphone port, water bottle pockets on the side, mesh cell phone holder on front strap, etc. Lots of pockets for just about anything you'd need on the go. Pros: This bag is by far one of the best bag's I've ever used. It wears extremely comfortably with excellent padding and plenty of room for all of your laptop peripherals & more. Cannot go wrong with this bag. Cons: The zippers are plastic so I can see how they might wear out after a while. Other Thoughts: Lifetime warranty is always a huge plus.